CATHOLIC GIFT SHOP LTD - Your Family Is Beautiful Wall Art Gift Set . Your Family Is Beautiful Wall Art Gift Set . 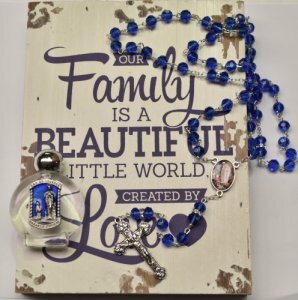 > Your family is beautiful, distressed wood effect plaque is free standing or can be hung on a wall, Plaque: 5 3/4" x 7 3/4", Depth:7/8"
> Lourdes apparition strass crystal rosary beads with Swarovski elements, rosary measures 18 inches approx.